The Janome HD1000 sewing machine has a traditional design for both durability and basic functionality. 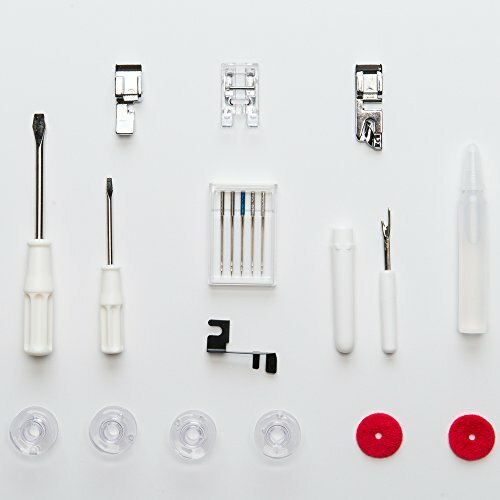 A selection of 14 stitches, built-in 4-step buttonhole, and assortment of standard accessories deliver everything an at-home sewer needs to get started on many types of projects. The HD1000 may not have a sweeping array of built-in stitches or a digital screen, but it does offer pure and simple sewing functionality. 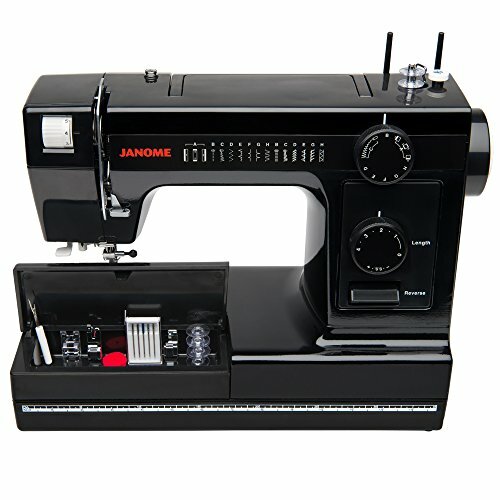 The Janome HD1000 is designed to handle heavy duty projects and all fabric types. It’s constructed of cast aluminum for complete stability as you sew. Most of the modern machines you’ll find today are constructed of plastic or other ultra-lightweight materials. While plastic cuts down the weight of a machine and makes it portable, it also diminishes its durability. The Janome HD1000 sticks to tradition with its strong metal body, making it more dependable than competing products. This machine will be around for years to come, even after hundreds of demanding projects. The HD1000 is built to be long-lasting; mechanical machines often have better longevity than newer, computerized options. Just in case something goes wrong, however, Janome includes a 25-year limited warranty with your purchase. How Does the Janome HD1000 Work In Practice? The Janome HD1000 machine is made with clear, basic functionality in mind. It’s built to be strong and reliable, not high-tech. As such, the included features are simple, but allow for consistent results, time and time again. Built-in needle threader: Prepare your machine faster and without straining your eyes; this machine has a built-in needle threader to get the thread through the eye of the needle with ease. 3-piece feed dog: To feed any type of material through the machine smoothly, the HD1000 has a 3-piece feed dog. This configuration can easily handle thick fabrics and multiple layers of material. Drop feed: Using the drop feed feature to remove the feed dogs allows you to choose free motion sewing whenever you want. It’s also great for quilting, stitching buttonholes, and darning. Reverse stitch lever: Tie off your final stitch in a snap with the reverse stitch lever, which is conveniently placed on the front of the machine for easy access. Extra-high presser foot lift: For quilting, working with thick fabrics like denim, and sewing through several layers of fabric, utilize the extra-high presser foot lift. This feature grants extra space to accommodate bulky projects. Push-pull bobbin winding: To wind the bobbin on this machine, push the bobbin to the right to lock it in place, use the foot pedal to wind the bobbin, then pull the bobbin back to the left when it’s full. Front loading vertical oscillating hook bobbin: The HD1000 is configured with a vertical, oscillating bobbin hook. The hook brings a thread loop to the bobbin case with each stitch; this machine has a hook that’s oriented to the front, moving forward and back with each stitch. Free arm: The included free arm allows you to easily sew small pieces like cuffs, collars, and the hem of pants. The features listed above come together to create a straightforward, traditional sewing process. This is ideal for beginners, sewers who are accustomed to mechanical machines, or anyone seeking a more simplistic setup than most computerized machines offer. 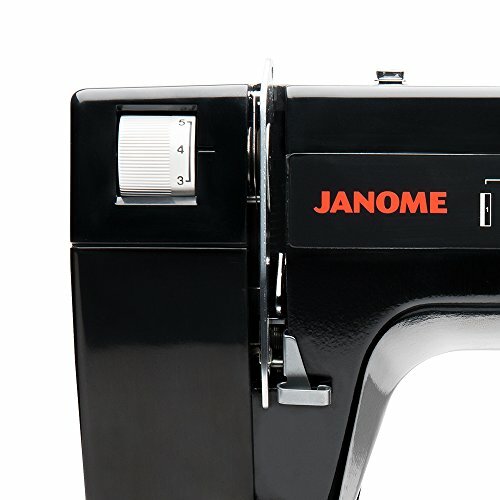 This Janome machine comes with 14 built-in stitches to help you complete an assortment of projects, from garment construction to quilting and more. Included in the 14-stitch selection are utility stitches for basic sewing tasks and stretch stitches for elastic and other tricky materials. The HD1000 also includes a built-in 4-step buttonhole stitch--perfect for all types of clothing and crafts. The buttonhole stitch makes the process of incorporating buttons fast and easy. Making your stitch selection is no problem thanks to the clearly labeled stitch selection dial. A stitch chart is plainly printed on the front of the machine; just glance at it to see which letter matches with the stitch you want. Then, turn the dial to your chosen stitch. This machine offers a maximum stitch length of 4mm and a maximum stitch width of 5mm. To adjust the length, use the dial located above the reverse switch. Each stitch option has a pre-set width measurement. This standard assortment of accessories allows you to get started on that first project as soon as the machine arrives. 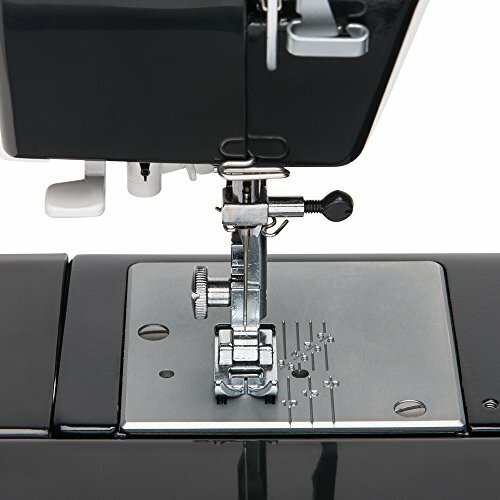 The included accessory feet are ideal for clothing construction, and the protective cover will keep your machine in top-condition whenever you’re not sewing. From denim to fleece and even leather, the HD1000 can handle just about any type of material, making it a reliable choice for all types of projects. The aluminum construction of this machine allows it to run smoothly for years. It develops less wear and tear than plastic sewing machines. The HD1000 is an excellent machine for beginners and experts alike; beginners will appreciate the simplistic functionality, while experienced sewers will love the high-quality construction. 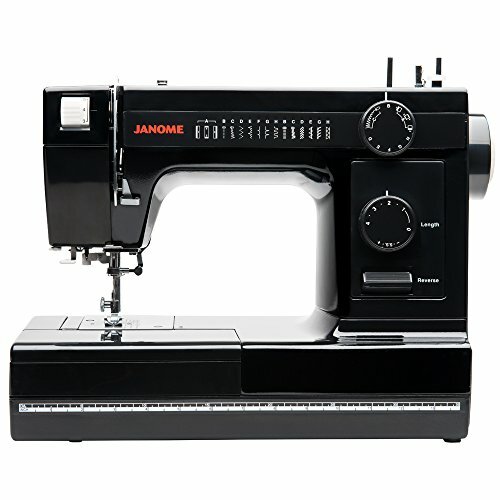 Due to its all-metal construction, the Janome HD1000 machine is heavier than other models, weighing in at nearly 17 pounds. This bulkier frame doesn’t allow for portability, (or, at least not convenient portability). The tension control of this machine is manual, and it can be difficult to find the right tension level for many types of fabric. Many reviewers noted that this machine must be rethreaded regularly, which can become a hassle as you’re trying to complete a project. With both the pros and the cons of the Janome HD1000 in mind, it’s clear that this machine is well-made and can handle demanding projects with ease. For sewers of all different skill levels, the HD1000 is a solid choice of machine, offering exceptional strength and dependability.